Product prices and availability are accurate as of 2019-04-20 23:49:31 BST and are subject to change. Any price and availability information displayed on http://www.amazon.com/ at the time of purchase will apply to the purchase of this product. Beet root juice and nitrates have been gaining lots of attention for their ability to improve aerobic ability and boosts muscle efficiency. Get more out of your training sessions, improve performance on race day, and aid muscle recovery by adding BeetVO2Max™ to your training regime. Powders are an efficient delivery system designed for maximum bioavailability of whole raw food. 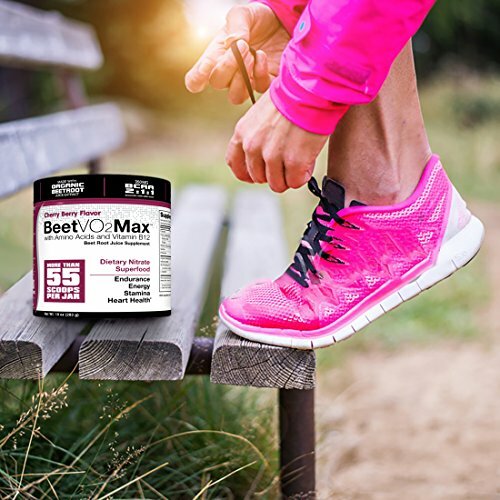 An extraordinary 15 pounds of fresh beets go into every jar of BeetVO2Max™ organic beetroot juice powder, offering unparalleled nutrition in a naturally sweet superfood. Our beetroot juice is freeze dried and packaged in a sterile vacuum container. Freeze-drying is the best method for preserving the complex chemistry, active enzymes and entire matrix of a plant in it's fresh form. BeetVO2Max™ is made by first extracting the juice from the beets, and then drying the extracted juice into a fine powder. 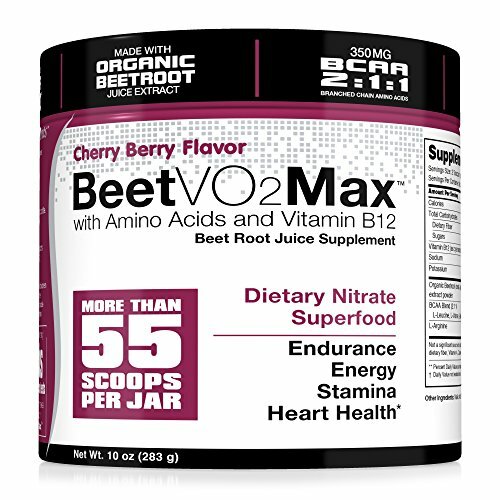 BeetVO2Max™ is highly concentrated, and thus more potent. The American Heart Association has suggested that consuming beet root juice can support a healthy heart and blood pressure. 100% ORGANIC: BeetVO2Max beets are ORGANIC and grown in optimum conditions assuring only the best all natural concentrated beetroot powder extract available. 10X THE NITRATES: An independent analysis shows BeetVO2Max contains a massive 10x the amount of Nitrites than the leading brand. 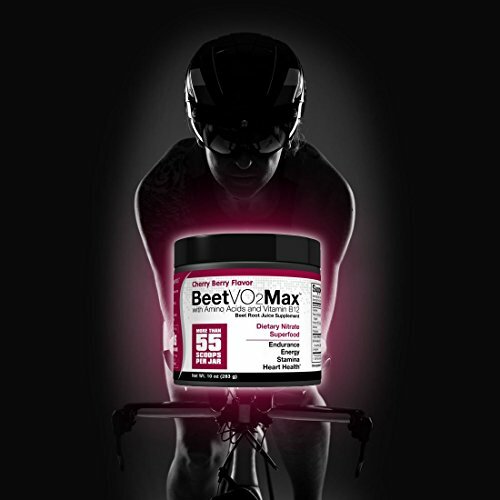 We also have 30% more servings, a full 10 ounces HYPER-ENDURANCE FORMULA: BeetVO2Max represents a revolution in all natural endurance formulation. 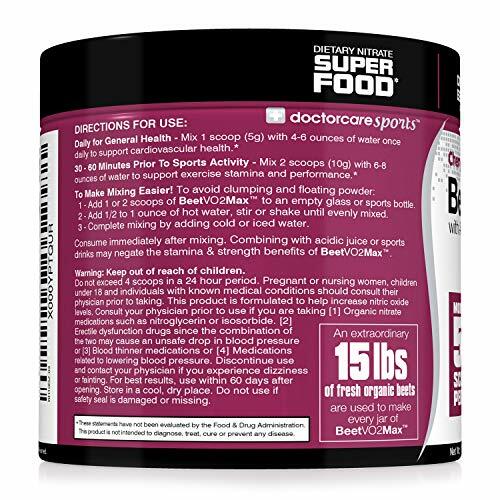 We made the most potent beetroot powder better by adding branched chain amino acids and B12 to Ignite your workouts and Explode your performance like no other. GREAT TASTE: Most beet root supplments taste like dirt or worse, right? 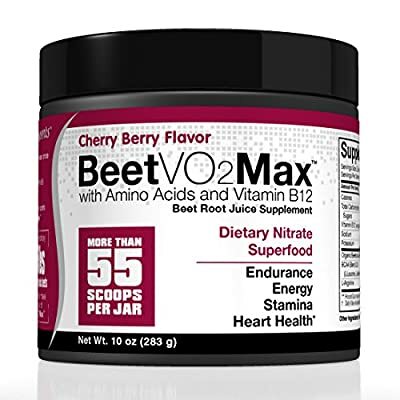 Not BeetVO2Max, ours tastes delicious (like beets) but with a slightly sweet (Stevia sweetened) berry cherry flavor. If you don't like other beet root powders, try ours. BEST GUARANTEE: If you are not totally, 100% satisfied with BeetVO2Max for whatever reason, you can get your money back, no questions asked.